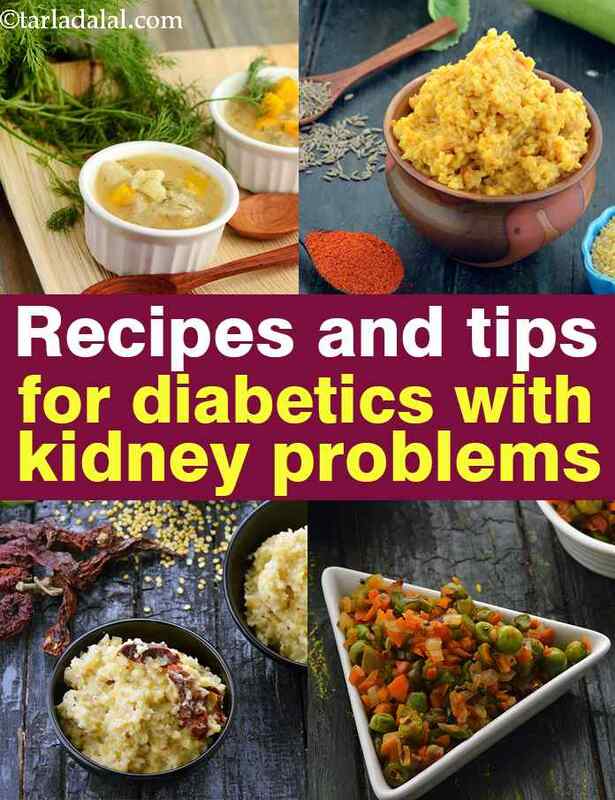 diabetics with kidney problems recipes and tips. Diabetes is a disease in which the body cannot make insulin or cannot utilize the insulin in the body. This leads to raised blood sugar levels which in the long run affects the blood vessels. When the blood vessels of the kidneys are affected, its functioning is hindered. The kidney may not be able to filter protein and hence it will be found in the urine. Also other waste material will build up in your blood. You might experience water retention due to excess salt in your blood. At this stage keeping blood sugar in control along with keeping your kidneys healthy should be focused through medication and diet. Carbohydrate monitoring is of prime importance to keep a check on blood sugar levels. Protein has to be consumed in restricted quantities to avoid excess load on the kidney. Fruits and veggies low on sodium, potassium and phosphorus count should be preferred. Salt has to consumed in restricted quantities to avoid fluid retention in your body. Since these diets are quite individualized depending on the intensity of blood sugar levels and kidney health, your doctor (endocrinologist and / or nephrologist) along with your dietitian are your best guide. Though diabetics are usually recommended to have whole grains and cereals, those with kidney complications are often recommended to restrict its intake as they are a high source of phosphorus and potassium. Prefer white bread over whole wheat bread. However barley and bulgur wheat are a healthier choice. Avoid rice and oats completely. But it’s best to work it out with their dietitian who will plan the carbs depending on your blood nutrient profile. The Vegetable bulgar wheat khichdi low salt recipe uses bulgar wheat which is low in phosphorus and potassium. Some of the best options in veggies are Broccoli, Cauliflower, Cabbage, Zucchini, Capsicum, Celery, Cucumber, Ladies Finger, and Eggplant. Have the mixed vegetable thoran recipe (low in salt),which uses some of these vegetables. The starchy veggies like potato, Sweet Potato, yam, Purple Yam, Sweet Corn are best avoided. Amongst the fruits prefer apple, Cherries, Pear, Peaches and Grapefruit. Protein has to be consumed in moderate amounts so balance between the intake of dairy products and pulses. Prefer low fat milk and low fat curds avoid the cheese completely. Avoid the nuts and chocolate along with baking powder, baking soda and ready to eat foods. Enjoy our recipes for Diabetes with kidney problems given below and other diabetic articles.